So, you want a large format printer? So, you wanted to get a large format printer? Making huge prints sounds great, but have you fully thought through what it is you want to do? 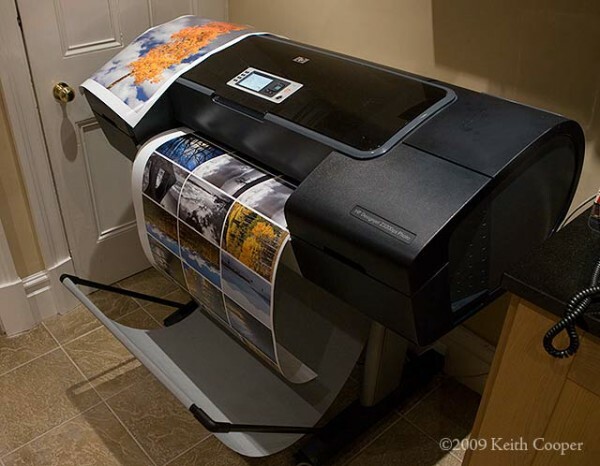 Keith Cooper has reviewed many large printers, and looks at some of the questions that sometimes don’t occur. There comes a time when printing your work at A3+ (13″ x 19″) on a desktop printer seems a little small. 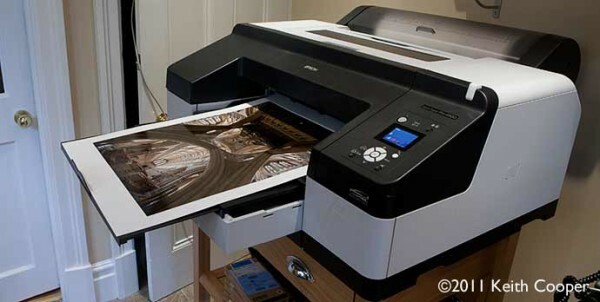 Maybe you’re tempted by a 17″ width printer, such as the deservedly popular Epson 3880 [review] or maybe you feel it’s time to move ‘Large Format’, which for the purposes of this article I’ll take to be 24″ width or larger. BTW I’ve a newer article specifically looking at 17″ printers and expanding on what’s in this article. 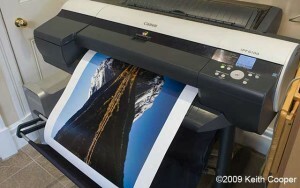 There is undoubtedly an attraction to seeing giant prints of your work on walls, and when you look at some of the deals available for large format printers, they look very attractive, compared to a high end DSLR and a few good lenses. I love having the ability to make my huge prints here, but you do need to think through some of the practicalities. I’ve had a large format printer here at Northlight, since 2004. We started with an Epson 9600 (44″ width), adding a 24″ Epson 7880 [review] in 2007, and replacing both with a Canon iPF8300 [review] in November 2010. I’ve also had numerous other printers here on loan for a month or so in order to do testing and write all the reviews on this site. With this experience I’m often asked about buying large printers. I’m not going to recommend any make or model in particular here, but I do have a number of questions that I feel should be asked, and a number of tips for ensuring that you get the best from such printers. Why do you want to print big? I know that large prints can look impressive. In all the exhibitions I’ve had in the last 10 years, the smallest print was perhaps 17″ by 25″, with the largest some 47 feet long (~14 metres), all printed ‘in house’. It’s a great idea, to be able to see all the detail in a big print. The perspective and whole feel of the image is changed. Where are you going to put the printer? If you’re used to using a desktop printer, then moving to Large Format necessitates a few changes. It’s big and heavy. Allow for at least two people to move it into place. Most couriers will just leave it on your doorstep on a pallet. It takes bigger paper – this can be expensive to keep in stock. Ink cartridges are much higher capacity – they are cheaper in the long run, but expensive to keep a set of spares. I have a spare room for such a printer. 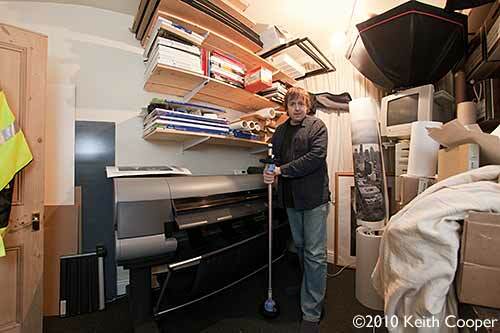 It used to be my darkroom many years ago. This is a fisheye view that doesn’t quite do justice to how small the room is. Note the heavy duty shelves above the printer for boxes and small rolls of paper. I’m holding the spindle for 44″ rolls of paper in my hands. What costs do you see? Large format printing is predominantly aimed at print companies, not the likes of us. I’ve even heard it said that some manufacturers and their sales networks would rather not have to deal with photographers and the like, since we just don’t buy enough paper, ink and support (with their much higher markup). As a group, photographers also distrust maintenance contracts, and any software that has signs of annual licensing (see the kerfuffle over Adobe’s actions). Give that many dealers base a fair bit of their business on paid support and the sales of expensive supporting software (RIPs etc. ), you can see how a photographer may be unlikely to make it into their desired customer category. When looking at the cost of a big printer, add in extra ink (but do note how much comes with the printer) and a few rolls/boxes of paper. There are other consumables too, such as maintenance cartridges (waste ink), and for such printers as our iPF8300, replacing a printhead (£300+). Ink costs for prints are notoriously difficult to assess. Some printers have software to help work out these costs, but bear in mind that the ink usage is based on steady use of the printers. If, like me, you don’t print every day, then more ink is actually used in cleaning and general start/stop operations. Printers wear out, even if (no, especially if) you don’t use them much. Think about when your printer might need replacement, and what you are going to do with the old one (used printers can be much more difficult to move than new ones). 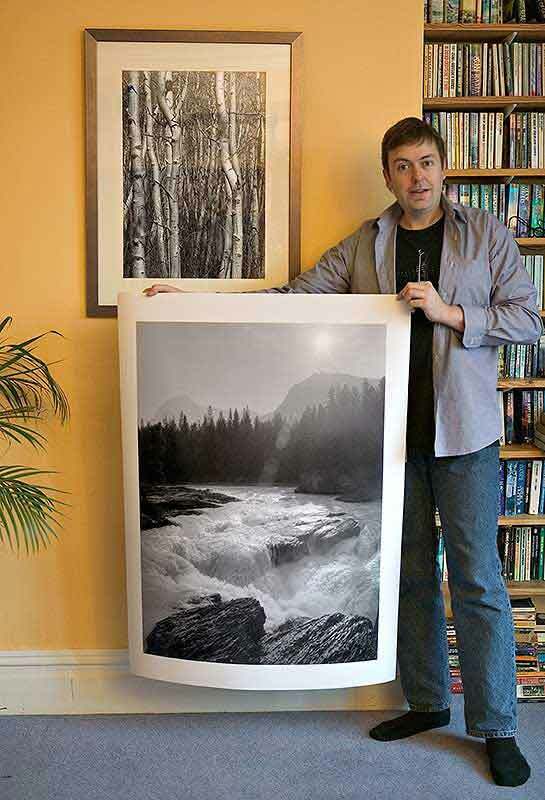 Prints need mounting and framing – do you know how much a frame for a 36″ x 24″ print costs? Are your photos up to it? I find making them challenges many technical and creative aspects of my photography, and improves my work at all scales. Whereas for small prints you can safely just add a bit of sharpening for printing, for large ones, aspects of sharpening become critical at all stages of your workflow, particularly if you are rescaling images for large prints. I’ve written more about this crucial aspect of my work elsewhere. With care (and good lenses) I’ve produced a few 24″ x 36″ (and larger) prints from my old Canon 1Ds (a mere 11MP) and a whole collection at A2 size. The largest one below is from scanned 35mm B&W film (24mm lens on OM2), the one behind me is from the 1Ds (picture from 2005). Both were printed on my Epson 9600. The two prints above used the ImagePrint RIP software for driving the Epson 9600. This was great for B&W printing on the Matte art paper I kept for the 9600. When I got the 7880 (for printing on lustre papers) the cost of extending the software to cover the new printer was, to my mind, excessive. If I had a printer such as the Epson 9900 here, I’d no longer see the RIP software as worthwhile. Currently I print on our iPF8300 using the Canon print plugin from within Photoshop. I have no use whatsoever for RIP software for the Canon. Where I do (rarely) need to gang up small prints on roll paper I use the ImageNest layout tool. This is Mac only, for windows, I’d suggest looking at Qimage. This is from when I was testing the HP z3200ps [review] The small prints were laid out using ImageNest. Good printer icc profiles are important, I make my own, but many paper suppliers will provide very good quality ones free of charge. What are you going to do with the prints? Most of Northlight Images’ print sales for large prints are to commercial customers, who want large, extremely detailed, prints for decorative and promotional purposes (most are architectural and industrial related). We specifically offer large (and very large) prints as an option for many of our professional services. It’s an additional way of differentiating our services, since I know that such specialist print capabilities are uncommon. Very few prints go to residential customers, and when they do, they are usually fairly small (A3/A3+ or maybe A2). Unless you know an awful lot of people with huge walls in their homes, you are quickly going to run out of friends who will take your prints. Selling prints is a tricky market to tackle. Making the prints is, in many ways, the easiest part. I know very few working photographers for whom print sales are a major part of their revenue streams. If you’re thinking of making money with your new big printer, then do have a look at these two specific articles from my Business of Photography section. At Northlight we don’t do wedding and portrait work, so I don’t have that outlet for prints, but if you’re considering it, then remember just how much work it can take to prepare the images, and remember to calculate -all- your costs. If you plan to compete on price in your print business plan (you do have one? ), then you have an entire long established print industry up against you. I don’t compete on price, and take the attitude that if a 20% cut in ink costs made much of a difference to my profitability, then it just says that I’m not charging enough. How often will you print? 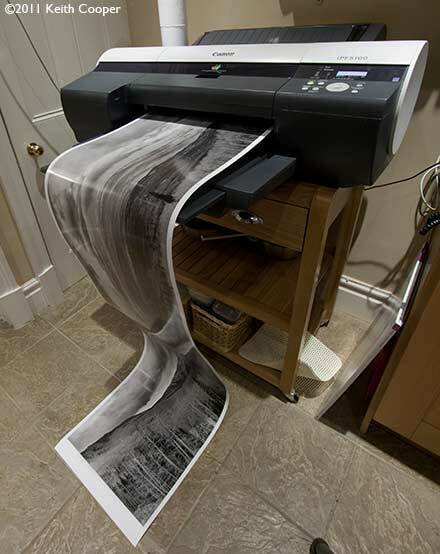 A large format printer is not like a modern motorbike that you can put away in the garage for a few months of bad weather, and then come Spring, check the oil, battery and tyres, and drive off. Large format printers are designed for heavy use. In commercial printers, they are often running all day long. The problem for typical photographers producing prints, is that it’s quite possible to go a few weeks without needing a print. This doesn’t suit big printers, and when recently looking into problems with our iPF8300, I talked to several people in the ‘large format business’, and lack of use was the number one cause of problems. I keep a 24″ roll of cheap proofing paper in our iPF8300 and try and make sure I print every week (a diary reminder helps). An 18″ wide 2″ high test print uses very little paper or ink, yet will suitably exercise all of the printer. I don’t even have to fire up Photoshop, since the printer has a disk in it, storing previous print jobs. I just go to the printers web page and re-print the test print. Although said that I was concerned with printers 24″ wide and above, I’ve often ended up saying that going for a 17″ width printer might suit more people looking to ‘go large’. The Epson 4900 and IPF5100 are both 17″ width, but take roll and sheet paper. The 4900 is just about a desktop unit. The choice of sheet/roll paper is one to consider. I use A3+ and A2 sheets for some prints with our 8300, whilst for most larger prints, and certainly the large panoramic ones, it’s roll paper. Do check that sheet paper is properly flat, since big printers can hit the edges of curled sheets with somewhat more vigour than small desktop ones. Both of these 17 inch printers do need to be treated like other large format printers, so I’d want to leave them switched on, and make at least one A4 sized print a week. But… wasting ink and paper for a print each week? If you find yourself fretting over the costs of new ink cartridges and good photo paper for your desktop printer, and begrudge every cleaning cycle your printer runs, then large format is maybe not for you. There are costs in making prints and costs to keep your printer running. …or you can run it more like a classic car. Something to enjoy using every so often, but needing regular care and attention if it’s not to deteriorate. I’ve chosen slightly more of the latter, since I know that there is not a very profitable business in photographic printing, or at least not without me spending a lot more time doing it. The current printer has more than paid for itself in print sales, but for profitability, it lags far behind my camera equipment. That’s a business and personal choice I’ve made. So, do you still need/want a large printer? I hope the information here has been of use – please do make use of the comments below if you have any questions, or think of aspects I’ve missed out? Update 2016: I’ve reviewed a few more printers since writing this article, and there’s not a lot I’d change!